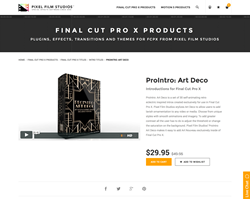 "With a set of 30 self-animating retro electric inspired intros Art Deco allows users to add lavish ornamentation to any video or media," said Christina Austin - CEO of Pixel Film Studios. 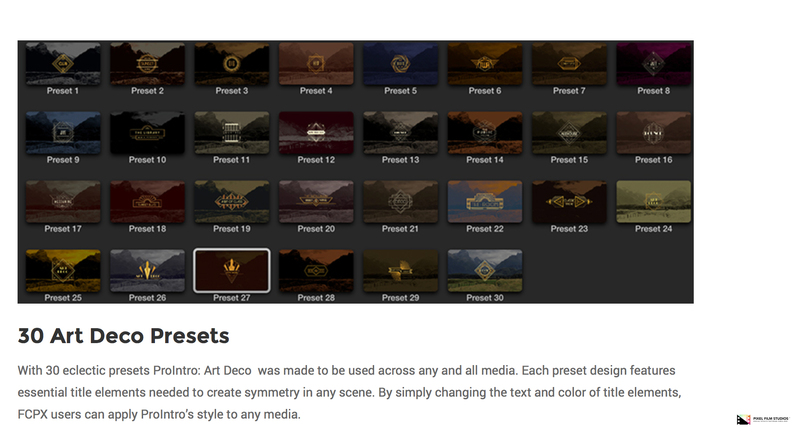 With 30 eclectic presets ProIntro Art Deco was made to be used across any and all media. Each preset design features essential title elements needed to create symmetry in any scene. By simply changing the text and color of title elements, FCPX users can apply ProIntro’s style to any media. This Plugin features intuitive controls that allow users to adjust the essential elements of each unique preset. Editors can determine the scale, position, and rotation of title elements with the drag of a mouse. With on-screen controls users can manipulate the overall appearance of presets with absolute ease. ProIntro presets feature a unique intro and outro animation to assist users in speeding-up the editing process. 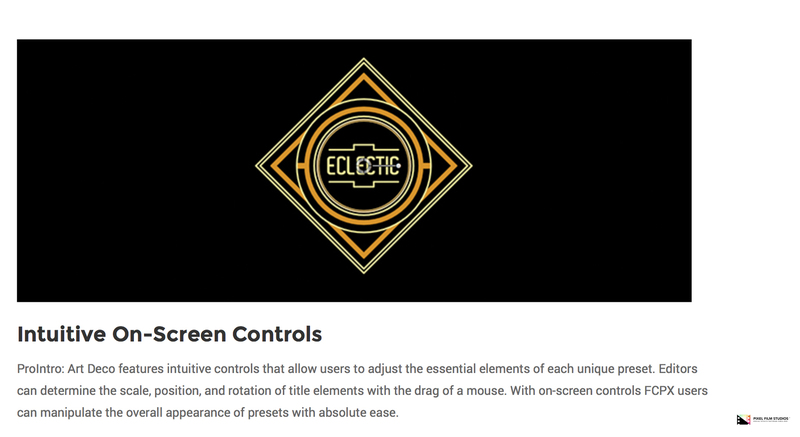 Using ProIntro Art Deco is easy, just drag and drop. 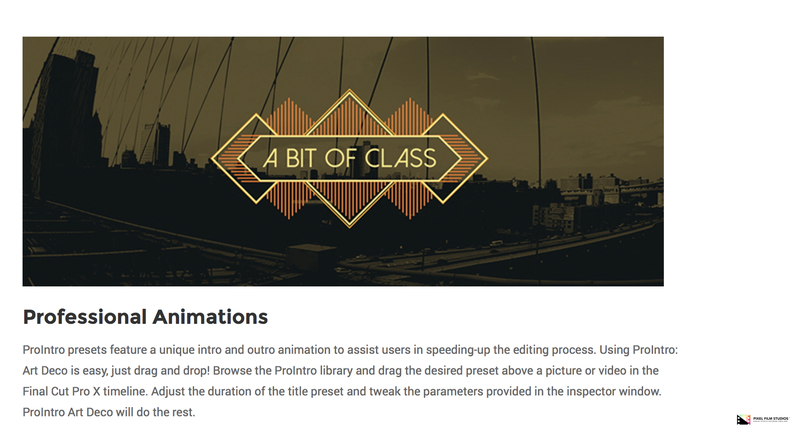 Browse the ProIntro library and drag the desired preset above a picture or video in the Final Cut Pro X timeline. Adjust the duration of the title preset and tweak the parameters provided in the inspector window. ProIntro Art Deco will do the rest. ProIntro Art Deco background controls allows users to tint the media below the presets with the fully customizable thresholds and saturations. Additionally, blur controls are provided to allow editors to achieve greater contrast between title elements and the scene below. 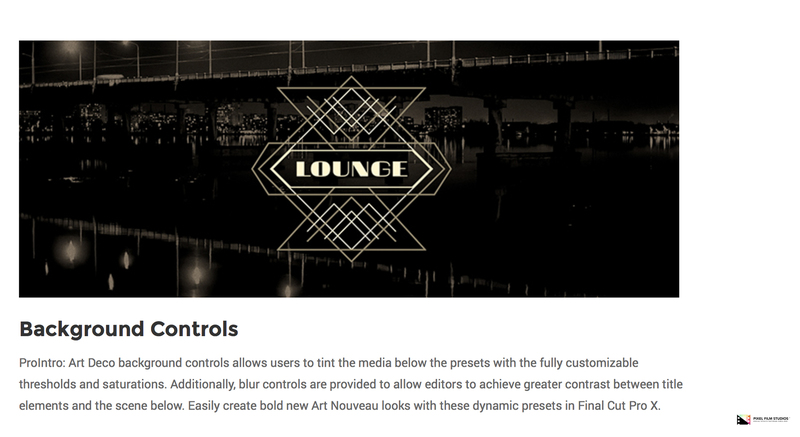 Easily create bold new Art Nouveau looks with these dynamic presets in Final Cut Pro X.